Cody's Original Roadhouse advertises hand-cut fresh steaks and bottomless salad bowls every day but if you tried to eat at the St. Petersburg location last week, you might have noticed the doors were closed during normal business hours. 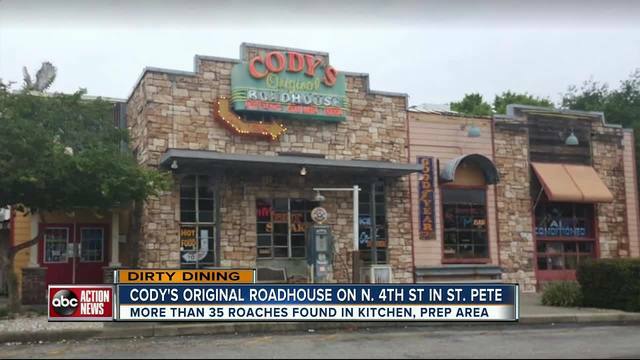 That's because inspectors found live roaches inside Cody's kitchen at 11270 North 4th Street. On Tuesday March 14, state inspectors discovered over 35 live and dead roaches under a grill on the cook's line, in an oven, on the back wall, and under the prep table. And it wasn't the first time the state warned them about a roach problem. Eight months ago in August of 2016, inspectors found almost a dozen live roaches and over 200 dead roaches in the kitchen. State inspectors also documented last week live flies on a case of sweet potatoes. Among the other 34 violations written in the inspection reports over two days, potentially hazardous cold food was being held at greater than 41 degrees Fahrenheit. Raw beef steak was at 49 °F, raw pork chop was at 54 °F, and raw beef was at 47 °F. A cross contamination issue also discovered involved raw chicken stored over raw salmon and the hand wash sink was not accessible for employees to use as it was blocked by a cooler, with no paper towels or soap. We at Cody’s take our food safety very seriously. As the owner of the 4th Street location I take full responsibility for what happened on this occasion. Unfortunately, there was an oven in our kitchen that was out of use and was scheduled to be removed. It was that piece of equipment that had been overlooked, when doing our own inspections, which led to the violation. The oven was removed and the health inspector returned, inspected and cleared us to open. This location has been a part of this community for almost 20 years. We are fully aware that when we invite you to dine with us we are responsible for your safety and we take that very seriously. I can assure you that this problem has been handled and will not be a concern in the future.